Support the network physicians by sending them patients. If the network is formed in that way it should be of gold standard caliber. But that’s easier said than done. We’re all familiar with the super-large networks that include anyone with a medical degree – as long as “anyone” agrees to see network patients for a discounted fee, which the network can then tout as “savings” for employers regardless of the quality of care. Most of these networks and the doctors in them came from the group health arena where modified duty, transitional duty, early return to work, the buzzwords of workers’ compensation professionals, are foreign concepts. And why should that be surprising? After all, workers’ compensation is only one, tiny room in the American health care house that Jack built. What workers’ compensation professionals sometimes forget is that most doctors, whether in or out of these networks, went to medical school because they wanted to devote their lives to healing the sick, not to becoming some company’s external medical personnel director. Many, perhaps most, physicians in networks that have physician directories the size of New York City’s phone book understand “injuries,” but not workers’ compensation, and that is not their fault. It is ours. We have not educated them sufficiently regarding workers’ compensation, nor have we cohesively partnered with them to help injured workers transition at the right pace back to full duty, which, in my 25-year Lynch Ryan experience, is where injured workers really want to be. Consider this. Most doctors have small practices that turn them into small business owners. I’ve never met one who liked that, the business end of medicine. Most are not technologically facile, and workers’ compensation injuries comprise a minor share of their “business.” Their responsibility focuses totally on their patients and what’s wrong with them. They don’t see a real need to be overly interested in the workplace; in fact, they most often don’t even know what or where that is. On the assembly line that has become American health care, where insurers force physicians to cycle through patients in fifteen minute intervals, who has time to probe deeply about the workplace and what goes on there? When some claims adjuster or nurse case manager wants to pin them down about physical restrictions or a date when their patient can return to work, they err on the side of humongous caution in order, in their minds, to “do no harm.” This leaves workers’ compensation professionals and employers befuddled, scratching their heads and wondering what is wrong with the doctor. They think, “Why can’t the doctor see what’s really going on here?” They don’t understand the doctors and the doctors don’t understand them. 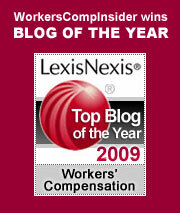 That’s the scenario in which workers’ compensation professionals very often find themselves. At Lynch Ryan, the only way we have ever found to deal with it successfully is one doctor at a time, sitting face to face and finding common ground. Occupational health specialist or not, an educated physician is a powerful weapon for good in the little world of workers’ compensation. In my next post I’ll describe the step-by-step process my colleagues and I went through to build the first workers’ compensation medical network in Massachusetts once upon a time. Here’s a teaser: It was a thing of beauty, profoundly successful for everyone involved, and would not be legal today. This entry was posted on Thursday, August 28th, 2008 at 8:31 am	and is filed under Best Practices, Medical Issues. You can follow any responses to this entry through the RSS 2.0 feed. Both comments and pings are currently closed.